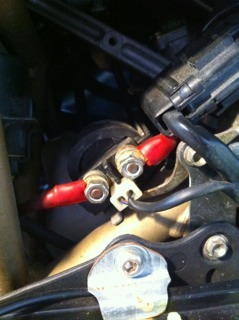 Positive from battery - solenoid - starter. The earth strap going to the rear of the engine looks all wrong but was like that when I got the bike , the thread on the case looks to be for an adjustable cable ? I know it's painful on a new bike but the paint should be removed where the ground cables are installed. your set up is the way Ducati did it. So everything the right way. But it turned out, that going that original way with two short earth cables to the frame (one from the battery and the back one) was not ideal. It could build up top much resistance especially for the starting circuit. So having a longer earth cable direct from the battery - to the thread on the case makes a difference. I think Ducati made it that way with their later models. Yes, same size cable at least. On mine I have a Motolectric cable kit.